Shin Ramyun Black, a premium version of the popular gourmet spicy Shin Ramyun, has released yet another portion size for its growing fan base. Sure to grace the pantries of a multitude of families in the months to come, this new snack size ramyun noodle bowl is not one to be overlooked amongst its competitors. 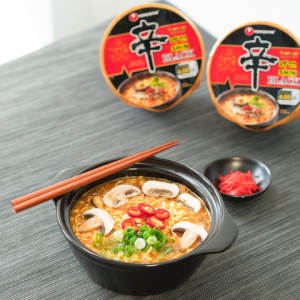 Originally released during the 25th anniversary of its popular predecessor, Shin Ramyun Black continues to be a frontrunner in Nongshim’s response to customer comments and suggestions with its innovative rich and creamy texture in addition to its bountiful toppings. When compared to its existing offerings, a packaged meal to be cooked on the stove top and a cup size that just needs hot water to be eaten as a snack or meal on the go, the newest bowl size is an in-between delight with a few added benefits that speak greatly towards Nongshim’s dedication to perfecting its products. In general, the newest bowl size is larger than the cup and doesn’t appear to have any major differences at face value. 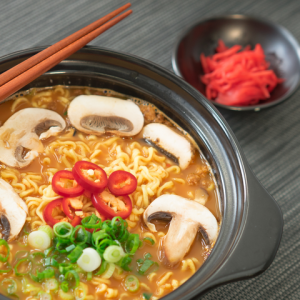 Yet when carefully examined and compared in a taste test, there are a few notable improvements that other ramyun competitors should take note of. First of all, in adherence to consumer health and safety concerns, the outer shell of the bowl has been refined to be microwave safe and can either be cooked in the microwave (as recommended) or steeped in boiling water like the cup size. In addition, when cooked using a microwave, there is a distinctive chewy texture that is not normally achieved by ramyun cooked outside of the stove. The ramyun formulation change with the assistance of a microwave that allows for the chewier more lifelike bounce doesn’t just end with stellar texture either, it even absorbs the soup base at an astonishing rate to complement the bouncy noodles with the rich spicy flavor of the creamy broth. As a whole, the Shin Black Bowl is a refreshing take on the classic on-the-go ramyun bowl that kids and adults have come to love as a mealtime supplement. Its overall size is not too overwhelming for a snack, but is also just right when looking for a quick hunger fix. Due to the creamy base, the Shin Black products are less spicy than the original Shin products so they are a bit of a middle ground that both spicy and non-spicy ramyun lovers can enjoy. Besides, with a plethora of dried vegetables and a heartier broth, just the richer ‘premium’ experience is worth a try.